Based on the calendar, spring should be here in two weeks and the weather is starting to show indications that spring is finally on it's way. With more sunshine and hopefully the last of the snow, my thoughts are turning more and more to spring and that is reflected in the jewelry that I am creating. I recently purchased several super duo bead combos from Bead and Glass Boutique in bright blues and silvers and this week I have been working on a herringbone bracelet modified from a tutorial at Potomac beads. This bracelet features three shades of super duos and instead of the 8/0 seed bead in the tutorial, an "O" bead is being used. 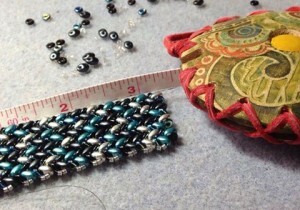 The beadwork is just about finished and now on to the selection of closures for the bracelet.